I'm there, big guy. I gotta favorite this build. Kids, BITD, this was a gas station. No convenience store, best you could do was a pack of coffin nails(to roll up in your shirt), a warm soda, and a 'pine' air freshener(that ALWAYS gave me a nasty headache). Oil in metal cans. You sat in the car, whilst fresh-faced attendants pumped the gas(a kid's first real job), checked the dipstick, wiped the windshield, and gave you a complimentary glass or item of silverware free("Please sir, oh we beseech you, good sir, to buy our gas!") Plus, they worked on cars! Anyway, this is an inspiring first look! What brand of fuel? In the frozen land of Nador, they were forced to eat Robin’s minstrels. And there was much rejoicing. Yep , "You can trust your car to the man who wears the star". “When I was 5 years old, my mother always told me that happiness was the key to life. I'd heard about 'You can trust your car to the man who wears the star." But it never made sense to me - The local sheriff was an idiot when it came to cars! LOL Yep, they are sometimes that way. There in a used car dealership across town that looked familiar. 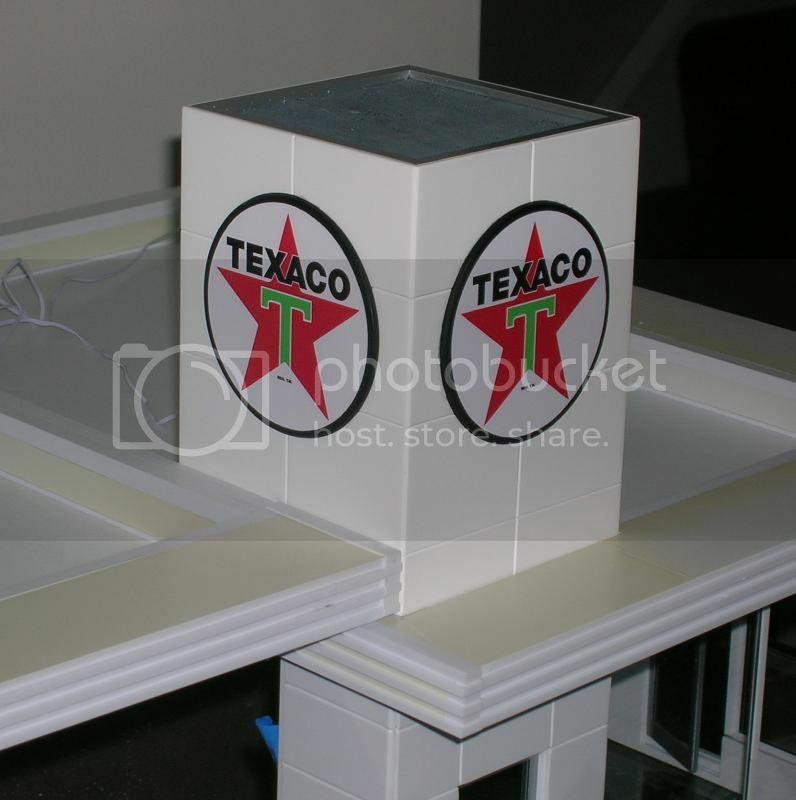 After checking the county auditor site, I discovered it had indeed been built in 1968 as a Texaco station. I visited it and measured everything. The exterior had no tower and the cladding had been covered, but the garage area still had the cladding and Texaco colors. Having used the measurements to create drawings, I added the missing pieces by studying photos. If you want something extremely specific, usually you have to make it yourself. I have a friend who intends to build a Gulf station. Very clean, and very precise looking. 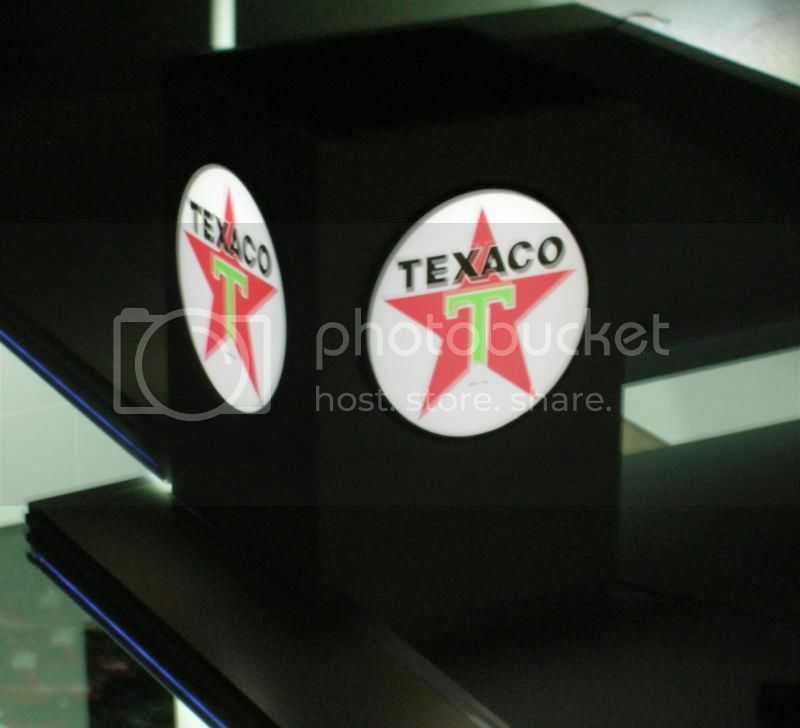 I remember those Texaco stations fondly, although I usually bought my gas at the dinosaur station. I'll be following this one. Don't forget to add the air hoses across the gas pump lanes so the cars make that "ding,ding" sound to get the attendant's attention. One of my first jobs as a teenager was working in one of these old gas stations. 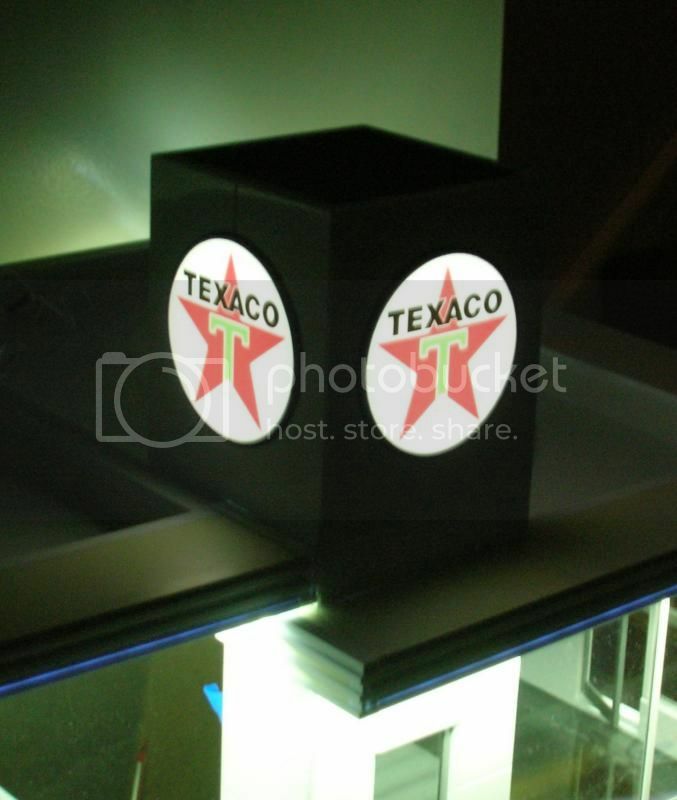 It was a Standard station, but your Texaco station brings back a lot of memories. Keep us posted on this build and the trip down memory lane. There is a used car dealership across town that looked familiar. After checking the county auditor site, I discovered it had indeed been built in 1968 as a Texaco station. I visited it and measured everything. The exterior had no tower and the cladding had been covered, but the garage area still had the cladding and Texaco colors. Having used the measurements to create drawings, I added the missing pieces by studying photos. If you want something extremely specific, usually you have to make it yourself. I have a friend who intends to build a Gulf station. Added lights to the overhang. This is going to take awhile to finish. Cool. What's the power source? Power source for all my LED lighting is a 12v regulated power supply. very cool, idea, way to use your resources,you have no idea how many of us out there remember these in one form or another. great work!!!!!!!!!! shaun.s. Your question implies gatorboard is what you think it is... a foam core with hard wood veneer on either side. to answer your question, this is how I make a wall. First, I cut out and scribe the inside and outside of the wall (.060 styrene sheet). Next, I create .156 x .200 square rods by gluing two evergreen .156 x .100 rods together. (the gatorboard I use is about .200 thick, thus the need for .200 rods). With these I line the outside edge of one of the scribed panels. I then cut the gatorboard to fit inside the edged panel. I super glue the gatorboard to the inside of the styrene panel. When set, I super glue the other scribed panel to the exposed gatorboard side. I then run liquid cement around the outside edged to seal the scribed panels to the .200 square rods. The short answer is: The edges of the gatorboard are covered by the .156 x .200 rods. I hope this made sense. I just noticed I didn't answer your whole question. 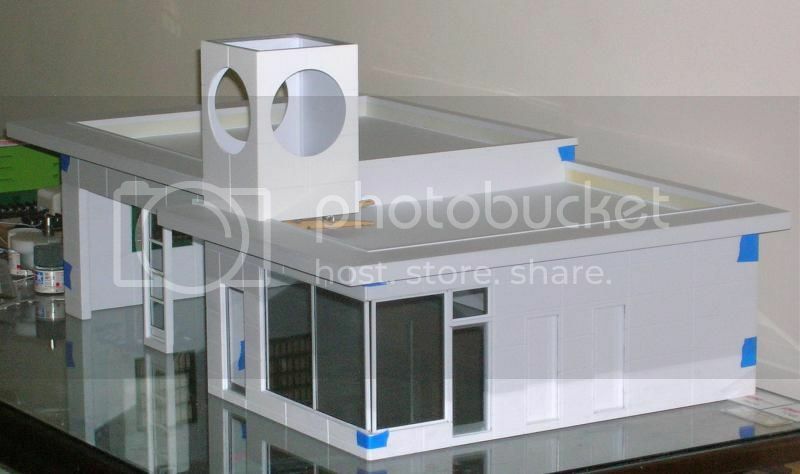 I made the windows with evergreen styrene strips. 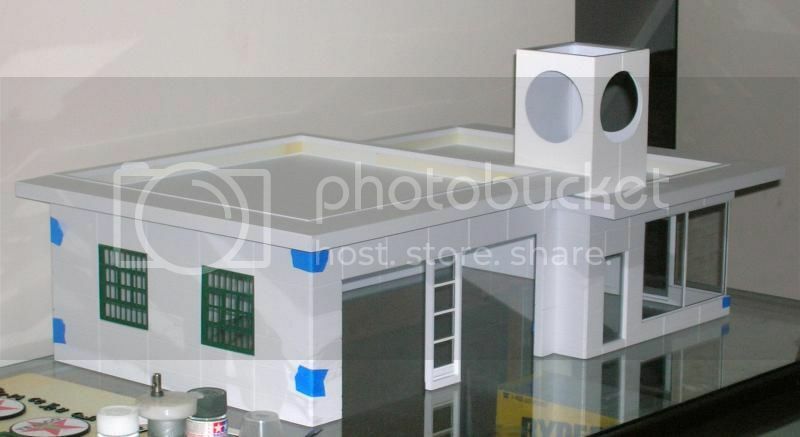 I laid out the pattern on a piece of flat styrene, glued down the window parts, then made a simple one piece mold with RTV. If you are exact enough, your molded pieces can go back to back against a piece of clear lexan, and the panes will line up perfectly. Thanks , That was the part I was trying to figure out. Looks identical to the Texaco that was near my parents house for years. Nice work! A little more progress. 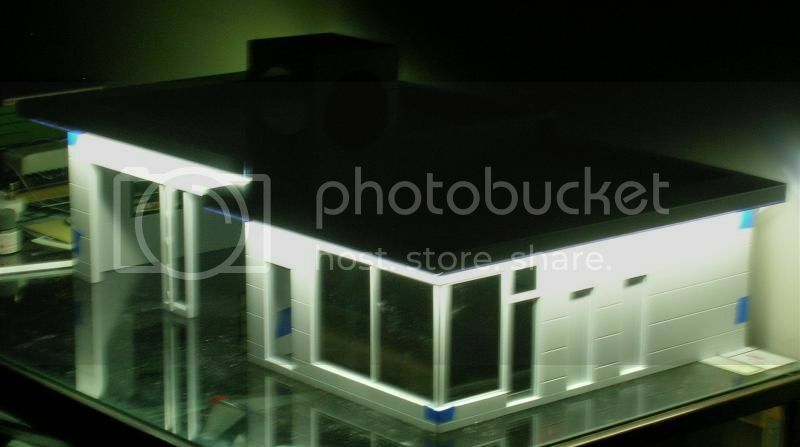 I'm using Dupli Color white acrylic lacquer for the building color. The little tower is more or less done. I'll fix the light leaks as I paint it. I'm painting a wall at a time so the polishing doesn't overwhelm me. Right now the tower is painted, and the wall with the garage doors is painted. I have yet to add the green trim, "Service you can TRUST" letters, and two red stars. By the way, carving letters is tedious work, don't care for it at all. The wall with the bays is complete, and is painted DupliColor white acrylic lacquer. The letters were carved from .060 styrene, and I'm glad they're done! Looks nicer every time I see it. Repstock...The more I see your work, the more I hope you take your time building this station. I think you could be on to having a show winning diorama when completed.. I appreciate the kind words and encouragement. It helps keep me motivated. Thanks to everyone who has taken the time to respond!